The arena cleared, so I put on her boots and out we went. Christy and Steph were there, and I handed them my cameras, which I carry most evenings. I was hoping to get some video of Maddie being extravagant – when she’s at liberty, she’s shown us some lovely, lovely gaits that I have yet to produce when in the saddle. Maddie willingly complied. It’s been a while since I’ve felt real suspension when riding her – but my riding has been spotty lately due to my work schedule and extended periods of feeling crappy. I will never forget the first time I started to get suspension with Maddie under saddle – all of a sudden, the trot started to feel really funny to me. “What’s happening?” I wailed to Christy. “You’re getting suspension!” she told me. “Errr, I don’t like it!” I replied as we buzzed by, and I fought, eyes popping, to stay with all the new motion below me. “YES, YOU DO!! !” Christy said, unequivocally. Anyway, Maddie was full of fancy last night. It’s fun watching her go at liberty, because more often than not, she rounds herself, stretches, and shows gorgeous gaits I wonder if I’ll ever be able to ride. Here’s one example – this weird picture is a still from a video – but look at how she uses herself. No wonder that floating trot felt so different to me the first time I encountered it! Here’s a little video snippet just as she was getting going. Just for fun, we decided to set up a little tiny cross rail to see how she jumped. We’ve not jumped Maddie, and don’t know if she’s jumped much, if at all. At first, she was hesitant, but didn’t run out. She got lots of praise for her effort. Within a few minutes, it was evident that this was a fun new game to Mads. She trotted and cantered easily over the X with little encouragement. And and even more quickly, the X became a raised cavelletti. Mads went back and forth over the rails without breaking stride. 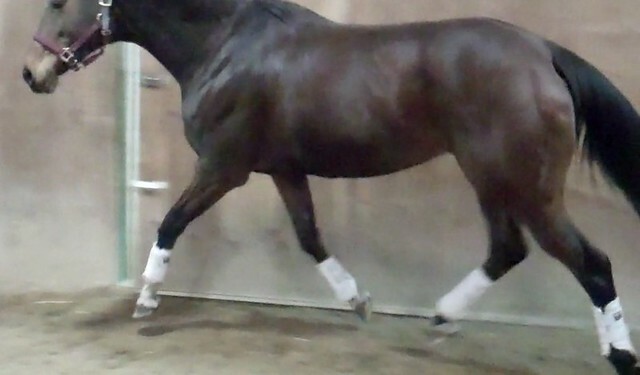 Watching this video, I can understand why cavelletti are favorite tools for developing gaits and strengthening stifles – you can really see her using her back end. It was a fun night, and a good session. In between all the new things, I focused on my groundwork skills, and got longing pointers from Christy. And Maddie seemed to enjoy the variety too – she was alert and attentive, and willing to follow direction. Interludes like this make the indoor arena less boring for all of us during these long Midwest winters. I went out to the barn today, looking forward to my first ride on Maddie in almost a week. It was a horrible rainy day the horses were inside, so I had allotted plenty of time for a nice long ride. However, there was one problem. I was the only one there – and I don’t ride alone (just not safe in my opinion.) No problem, I thought. I have some time to kill, and Maddie was pretty muddy. I decided that a marathon grooming session would be a good way to pass the time until someone else arrived. I curried (twice), brushed (thrice), picked her feet, picked clumps of mud out of her mane, but decided to bypass the dirty tail entirely. And I was still alone. So I shelved riding, and decided that a groundwork session was in order. Picking up a longe whip, I took a sparkling Maddie into the arena and turned her loose. My plan was to work on my ability to read her and influence her movements while at liberty. In past lessons when we’ve worked on longing Christy has had me work on keeping the mare’s attention and controlling her movements from the ground. Maddie was feeling frisky, and started trotting back and forth between the two barn doors that lead back to the barn. She is always drawn to this end of the arena when she’s turned loose. Standing between them (and at a safe distance of course) I started the session by preventing her from doubling back in front of the doors. As she trotted by me going left, I extended my left arm (a cue I’ve been using with her when longing, to indicate the direction I want her to go), and flicked the whip with my right hand just as I could see her start to think about wheeling and turning back to the right. It worked, and she kept moving left, circling around me. I switched the whip into my left hand, extended my right hand, and stepped toward the place she was headed. A ha! Maddie changed direction neatly and went back around to my right. She had been working pretty hard so I said “easy” and she dropped into a fancy, fancy trot – uphill and extended. 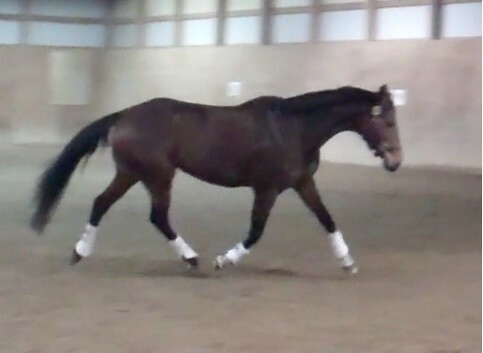 I gently kept her going in a big circle, and Maddie treated me to show of the entire range of her trot. She rounded, she stretched, she extended, and even collected, keeping her back up and staying round of her own volition. It was thrilling to watch and I really regretted leaving my iPhone back in the barn, otherwise I would have grabbed some video. As she trotted I kept moving her around, changing directions and moving the arc of her circle. She listened well, and stayed attuned to me. I brought her to a walk, then a halt. I called her to me, and gave her a much deserved head scratching. Even though we didn’t ride, I was really happy with how well we worked. Good mare! She's full of ideas. Not all are good. I was looking forward to my lesson tonight. My new position is getting stronger. The temperature was 18 degrees warmer tonight than last’s meager 10 degrees. I put on a cool black sweater and my tall Mountain Horse Fusion boots. Yes, I’m cheesy enough to think they look cool. As I swaggered out the door, my thoughts were of big trots and leg yieds, of forward horses and gorgeous canters. I grabbed my Flip. Yep, I wanted some video of tonight’s ride. No, the rest of this post will be devoted to telling a tale of plans gone awry. I pulled Mads out of her stall, after greeting her with some neck scritches which she eagerly accepted. But about two seconds after putting her in the cross ties, I noticed that her demeanor was different. Her ears were up. She was staring straight ahead down the aisle into the arena. She was tense. I picked, curried, brushed and tacked. We went into the area, and Maddie’s thoughts were clearly everywhere but on me. Her muscles were quivering, nostrils were dilated, her eyes wide. The ears were pointed everywhere but at me. You see, it was pretty windy outside – you could hear it gust and howl – and there were occasional banging noises on the metal arena doors. Christy told me that a lot of horses had been acting up that day. I guess it was our turn. I finished the routine, tightening the girth and walked her a minute. She was tense and jumpy, snorting and ignoring me. I pulled the stirrups off the saddle and picked up a longe line. I quietly led Mads to the middle of the empty arena, and asked her to walk. Her head was turned away from me, and she was blowing a bit through her nostrils. The doors banged and she hopped into a tense, giraffe-y, nervous trot, spooking and shying. By this time, Christy had made it into the arena, and told me to get control, which seemed at that moment to be unlikely – Maddie’s attention was everywhere but me. We were going straight back to some of the groundwork lessons I had done with Mads earlier this summer. I have yet to write about those adventures – but the gist of the situation was this – I was being a pushover, letting Mads get away with behaviors I shouldn’t, and she was becoming disrespectful. Simply put, I had to get my act together if I was going to continue riding her and working safely around her. And I got the job done! 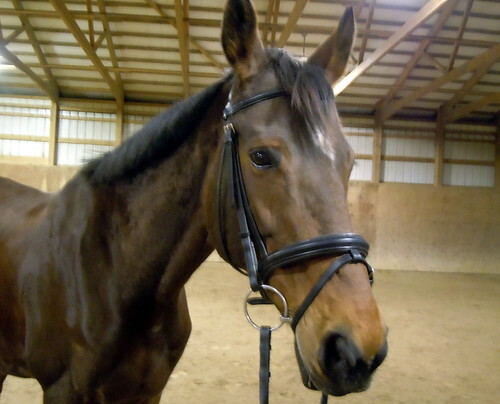 We did a lot of basic groundwork, and I quickly had a much more pleasant horse. She really was looking for a leader, and once I established the fact that I was the boss, and gained her acknowledgment of that fact, I had an entirely different and happier horse. This process did teach me that you have to stay on top of these things, however, and not let familiarity become an excuse for unwanted behavior. Occasionally, we go back to Basic Groundwork 101 and tonight was one of those nights. Christy told me to assert myself on the longe, and had me shorten the line so I could maintain some contact and bend as I worked the mare. 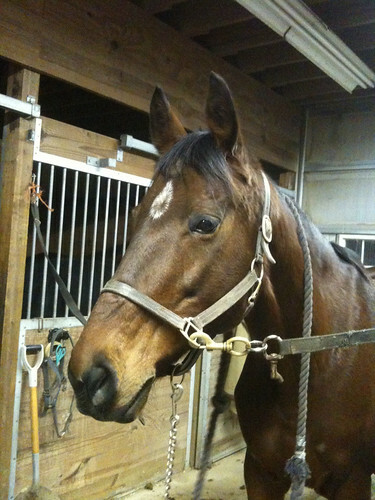 As I longed her, Christy also had me move forward, and move the mare around the arena. Any movements that were not my idea – an uninvited turn, change of gait, a spook – were not to be rewarded. The pressure had to intensify when Mads reacted in an unwelcome manner. We longed all over the arena, and for a long time, Mads was simply not listening to me. The drama continued but I kept at it, changing direction and moving her around while Christy coached me from the sidelines. Eventually, Mads started to relax, stretching as she trotted, even as the wind howled outside. I asked her to walk, and she exhaled deeply, stretching her neck out. She was relaxed. Her ears relaxed, and one was turned toward me. Okay, so the mare had mellowed out, but I certainly hadn’t. All the confident swagger from earlier before had long vanished. My heart was pounding and I swear, my femurs were both missing – my legs felt far from steady. Leading my now relaxed, floppy-eared, drooling mount back to the mounting block, I tried to get a grip on myself. Christy suggested putting the quarter sheet on – a chilly horse is a sassy horse – and I agreed. I needed a bit more time to compose myself. I took a minute to convince myself to put my foot in the stirrup and swing up. “Breathe,” came the crisp command from Christy, who started us walking in circles. She knows me and Mads cold, and she knew that I was rattled. We walked in figure eights and small serpentines, keeping the mare engaged and bending. “See? You’re fine,” she said, reminding me that really, none of Maddie’s spooks were bad – she pretty much spooks in place, and I’ve ridden them before and will ride them again. The wind howled and we rode on, me barely breathing, and Maddie chewing the bit and stretching, probably wondering what the big deal was. Tonight marked the first time that I had ever worked a horse down from a high energy/high stress situation into safe riding mode. So, despite the fact that the real work happened on the ground, the win was in fact in the saddle. George Morris, in the clinic I audited recently, said something as he was watching a talented rider give her hot and super-forward Thoroughbred a beautiful, tactful, empathetic and effective ride. “Thoroughbreds require tact and compromise,” he said, watching the pair make child’s play of a difficult course of jumps. It sounded good at the time, and I nodded to myself in agreement when he said it. But after tonight, I really understand what he meant.